A few months ago, I was driving through Vaughan, north of Toronto, on my way to IKEA, when I passed something that took me completely by surprise. It was a sign that had once said 'Master Donut,' in exactly the same font as in the photo here. Seems like that building was once a MisDo location that changed the name and kept most of the sign lettering, and a little thrill went through me to see it. 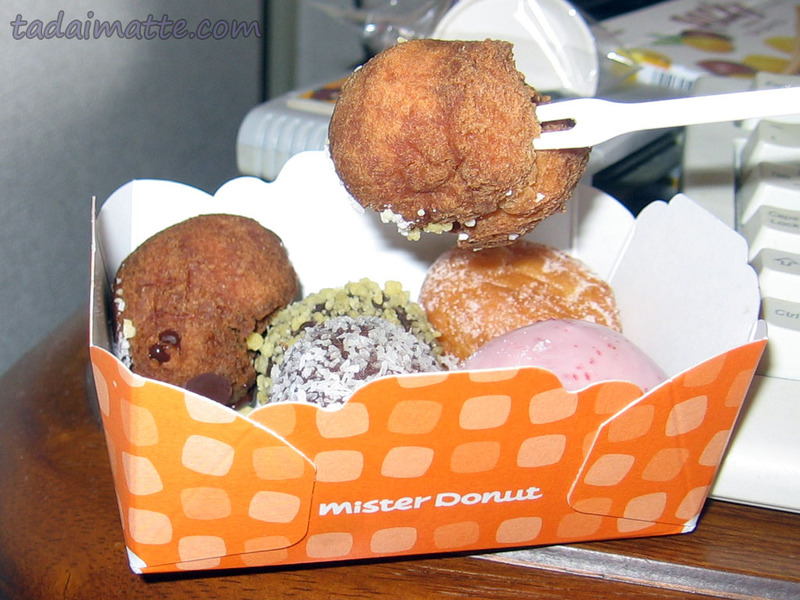 Mister Donut is by far the most popular donut chain in Japan. Krispy Kreme and Doughnut Plant have given MisDo a little competition in Tokyo, but with over 1,000 stores nationwide, it's unlikely that it's much for them to worry about! I really liked Mister Donut - as a Canadian, my loyalties do lie with Tim Horton's, but it's hard to argue with an Angel Cream. In Pennsylvania and Ohio, many Mister Donut stores became known as Donut Connection, serving the same menu as Mister Donut once did (and my attempt to visit one of these on the way back to Toronto from Columbus last year failed, too! ), and the Godfrey, Illinois location is supposedly still in business under the Mister Donut name, but it is the only one left. It's a shame, because I found Mister Donut donuts a great deal lighter, fluffier and less greasy/heavy than others, plus I love iconic brands. I collected the MisDo point cards and had traded them in for a bunch of the special coloured coffee cups before I left. I hoped to obtain all six colours. As it turns out, disaster struck my cups one day, and now I only have two remaining! On a future trip to Japan, I'm hoping to pick those up somehow. I don't think I could possibly eat the hundreds of donuts necessary to get all four via points, but I'll give it my best try, especially since to me, these donuts are head and shoulders above Tim's. Jam-filled and Bavarian cream are not my thing - but give me green tea, dark chocolate pudding, Pon du Lion or sugary, fluffy whip, and I could most certainly make a good effort toward my cups on a month-long trip! Mister Donut, I miss you! Come back to Canada someday!